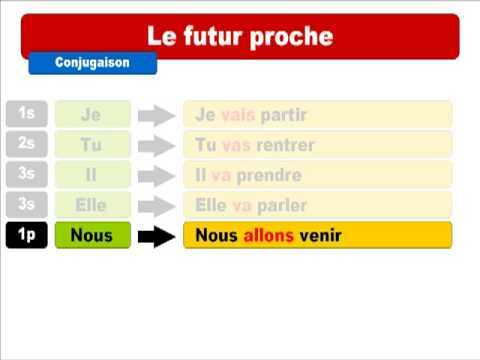 You already know that in some cases, we can use Le Présent to express immediate/near future actions in the Continuous Present in English (I'm coming soon) - see Using Le Présent for immediate/near future actions. = I'm going to come. Je vais aller au cinéma. I'm going to go to the cinema. On va faire quoi, demain? Nous allons manger des pâtes. We're going to eat pasta. Are there any specifications in futur proche. Is there a way to see what my answers were to see where I went wrong? Bonjour Stéphanie ! When you look at your Correction board, after taking a test, your answer is indicated by a symbol in the "You" column next to the answers. I hope that's helpful! À bientôt ! Bonjour Susan ! Quelle est votre question ? Peut-on dire, par exemple, « nous allons aller continuer apprendre chanter »? Bonjour Rod ! Here you need to be aware that some verbs are always followed by prepositions: so "je vais + infinitive", but "continuer à + infinitive" and "apprendre à + infinitive". Also "nous allons aller" sounds very redundant here. Therefore, the correct sentence would be: "Nous allons continuer à apprendre à chanter." A bientôt ! Bonjour Aurélie, A great reminder about the prepositions being REQUIRED with certain verbs, even in the infinitive. So very clarifying, and therefore so very helpful. Je te remercie!